Hello, IT administrators! In this walkthrough, we'll show you how you can quickly and easily use the new Microsoft Education system, consisting of new and existing cloud services and tools, to implement a full IT cloud solution for your school. Use affordable devices and simple setup - Boost creativity and get started instantly with Windows 10 devices that support Windows Ink. 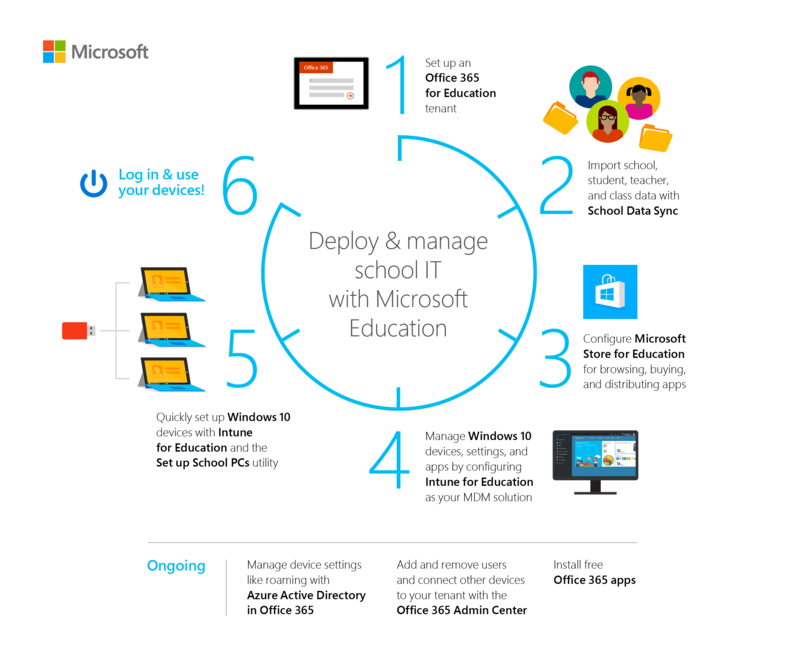 Set up devices in minutes and stay in control with the new Intune for Education. Collaborate in a modern classroom - Help students become career-ready with Office apps like Word, Excel, PowerPoint, and OneNote. Increase comprehension and outcomes with the most advanced teaching apps like integrated Learning Tools. Go beyond the browser with inspiring apps for classroom learning - Inspire with Minecraft: Education Edition and innovative apps from the Microsoft Store for Education. Go to the Microsoft Education site to learn more. See How to buy to learn about pricing and purchasing options for schools, students, and teachers as well as academic pricing and offers for qualified K-12 and higher education institutions. The end-to-end process for deploying and managing a full cloud IT solution with Microsoft Education is outlined here. Depending on your setup scenario, you may not need to implement all these steps. Click the link to watch the video or follow the step-by-step guidance for each. Make sure all the devices that you want to configure, such as student PCs, have the latest Windows 10, version 1703 image installed. We recommend Windows 10, version 1703 to take advantage of all the new features and functionality that Windows supports. This version of Windows is also compatible with the latest version of the Set up School PCs app and the versions must match in order for Set up School PCs to provision the devices. If you don't have Windows 10, version 1703 installed on your devices, we recommend upgrading. This process takes a while so start this task before proceeding with this walkthrough. Have an education-verified tenant to qualify for an Office 365 for Education subscription. You also need to be education-verified to use School Data Sync and Intune for Education. If you don't have an education-verified domain, don't worry. We'll show you the steps on how to do this. If you need to get education-verified, it may take up to two weeks for the verification process to be completed. To make sure you have a successful experience with deploying and managing a full cloud IT solution with Microsoft Education, select the scenario that best describes your school or how you'd like to get started. Trying out Microsoft Education in a production environment means you'll be using real school data as you evaluate the features and tools. This requires more time to get fully set up and going. Go to https://aka.ms/sdssignup and fill out the form to sign up for School Data Sync and receive a free, one-on-one support from Microsoft. A team from Microsoft will contact you to help get started with Microsoft Education. If you want a quicker way to evaluate Microsoft Education, you can use a trial environment instead. Once you get an Office 365 education-verified tenant, trying out Microsoft Education in a trial environment is an easy way to evaluate all the features and tools. Here, you'll use promo codes and sample files as you follow the walkthrough. 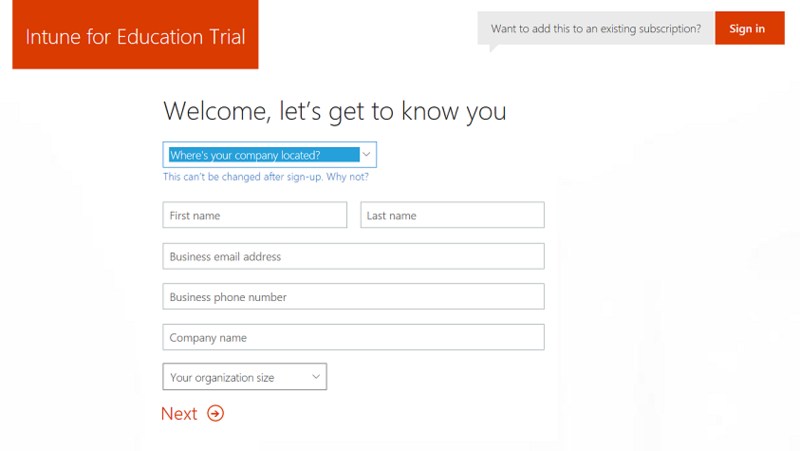 To get started with Microsoft Education in a trial environment, follow these steps. Set up a new Office 365 for Education tenant. Wait for your tenant to be education-verified before proceeding with the next step. Verification can take up to a few days. Once you have an education-verified tenant, click https://aka.ms/intuneforedupreviewtrial to apply the Intune for Education trial promo code. In the Intune for Education Trial page, on the upper right, click Sign in next to Want to add this to an existing subscription?. Select Admin > Users and then search for your admin account. In the user page, select Product licenses and expand the Office 365 Education license you assigned to yourself. Confirm that School Data Sync is turned on. Skip ahead and follow the rest of the instructions in this walkthrough beginning with Use School Data Sync to import student data. Already have an Office 365 for Education verified tenant? Just sign in with your global admin credentials to apply the Intune for Education preview trial code to your tenant and follow the rest of the walkthrough. Click https://aka.ms/intuneforedupreviewtrial to get started. Enter your Office 365 global admin credentials to apply the Intune for Education trial to your tenant. If you don't already have Microsoft Teams deployed to your tenant, you can start with Enable Microsoft Teams for your school and then follow the rest of the instructions in this walkthrough. See the Microsoft Education documentation and resources hub for links to more content for IT admins, teachers, students, and education app developers. Single Sign-On (SSO) - Allow your Azure AD users to access SSO-enabled apps, so they don’t need to type in their credentials to access these apps. MDM auto-enrollment - Devices are automatically enrolled with Intune upon being joined with Azure AD join. Enterprise state roaming - Keep school data and personal data separate on your devices. Dynamic groups - You can use dynamic groups to create rules that populate your groups (for example, a group with all 9th graders) instead of having to manually add or remove members of the groups. The group stays updated by continually staying populated with members that fit the rules you pick. Password write-back - Allows you to configure Azure AD to write passwords back to your on-premises Active Directory. It removes the need to set up and manage a complicated on-premises self-service password reset solution, and it provides a convenient cloud-based way for your users to reset their on-premises passwords wherever they are. Self-service BitLocker recovery - A self-service portal that allows your employees to retrieve their BitLocker recovery key and avoid support calls.